Most people believe democracy is a uniquely just form of government. They believe people have the right to an equal share of political power. And they believe that political participation is good for usâit empowers us, helps us get what we want, and tends to make us smarter, more virtuous, and more caring for one another. These are some of our most cherished ideas about democracy. But Jason Brennan says they are all wrong. 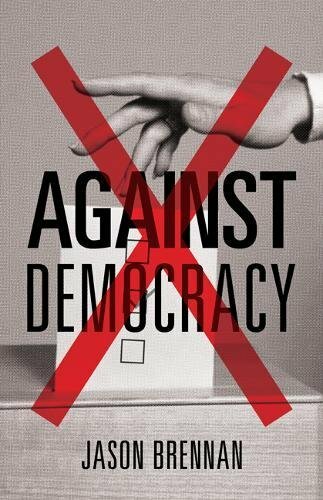 In this trenchant book, Brennan argues that democracy should be judged by its resultsâand the results are not good enough. Just as defendants have a right to a fair trial, citizens have a right to competent government. But democracy is the rule of the ignorant and the irrational, and it all too often falls short. Furthermore, no one has a fundamental right to any share of political power, and exercising political power does most of us little good. On the contrary, a wide range of social science research shows that political participation and democratic deliberation actually tend to make people worseâmore irrational, biased, and mean. Given this grim picture, Brennan argues that a new system of governmentâepistocracy, the rule of the knowledgeableâmay be better than democracy, and that it's time to experiment and find out.